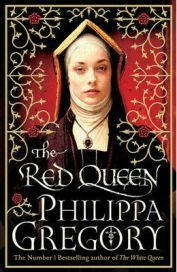 The Red Queen is the second in the Cousins at War series by Philippa Gregory, set during the Wars of the Roses in the fifteenth century. The first novel, The White Queen, followed Elizabeth Woodville, who was the wife of Edward IV, the York king. The Red Queen covers a similar time period but from the point of view of Margaret Beaufort, mother of Henry Tudor, who was to become Henry VII. The novel opens when Margaret is a young girl. With events taking place during a time when women had no choices and little education, her dreams for what she wants to do with her life are doomed to fail. She is married young, with the intention of having children to carry on the Beaufort line, who are close to the throne. She gives birth to Henry Tudor, but her husband is killed, and she is soon moved onto another, and later makes a third marriage of her own choosing. An incredibly pious woman, she becomes obsessed with putting her son on the throne, and believes it is their destiny. The story of The Red Queen is course true. Much of the novel is told in the first person, and of course this means that historical liberties are taken: dialogue is created and events are adjusted to suit the novel. The Red Queen is what you could call a dramatization of history – based on fact but with necessary additions. In The White Queen, Elizabeth Woodville is a fairly sympathetic heroine, easy to engage with and support. Margaret Beaufort, on the other hand, is not. As a child she is overly-pious and this continues throughout her life; her dreams of becoming an abbess or sainted crusader are thwarted. However, her piety is somewhat lessened by the fact that she is always wanting people to see how devoted she is to her faith. I may be an atheist, but I’m quite sure that religion isn’t supposed to be for show. This did not warm me to Margaret at all. In addition, her self-professed piety is at odds with her desire to put her son on the throne and to have all the nice things that come with being the king’s mother. Although she loudly professes otherwise, and indeed constantly goes on about Elizabeth’s materialism, she is materialistic herself to a degree. The events of the novel are exciting and make for a good read, although as Margaret is the narrator we often hear of events second hand, as she has no part in them as a woman. However, in the all-important final battle of the novel, it switches to a general third-person narration in order that we miss none of the action. Despite knowing the outcome of Margaret and her son’s story, and indeed many of the details along the way, I found I was on edge at times waiting to find out what was going to happen. I suppose although Gregory has always been faithful to history to this point, one of these days she might write an “alternate ending” novel, so feeling on edge isn’t too ridiculous! And of course with this being a novel, the reader is much closer to the characters than when reading an impartial history text; however well written and readable it may be, the characters generally remain at a distance. All in all, I enjoyed The Red Queen, but the character of Margaret Beaufort made it less enjoyable than The White Queen. However it was certainly an enjoyable and well-written historical novel, and it is also one which can be read on its own; I don’t feel that it is necessary to read the series in order. Some prior knowledge of the Wars of the Roses would be beneficial, but is not essential; I read The White Queen with no prior knowledge, and although I have done some reading on the subject between the two novels, I am sure I could have followed and enjoyed The Red Queen had I not done this. No Comments on "The Red Queen"